The Krugerrand is a South African gold coin, first minted in 1967 in order to help market South African gold. The coins have legal tender status in South Africa but are not actually intended to be used as currency, which is a reason it is regarded as being one of the world’s medal-coins. 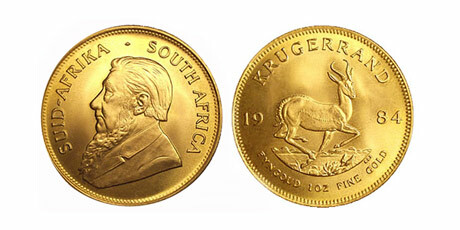 The Krugerrand was the first gold coin to contain precisely one ounce of fine gold. By bestowing legal tender status upon the coin, Krugerrands could be owned by citizens of the United States, which at that time prohibited private ownership of bullion but allowed ownership of foreign coins. However, due to the policy of apartheid in South Africa, the Krugerrand was declared illegal to import in many Western countries during the 1970s and 1980s until that system was lifted between 1990 and 1994. Since the Krugerrand is minted from gold alloy that is 91.67 percent pure (22 karats), the actual weight of a “one ounce” coin is 1.0909 ounces (33.93 g). The remainder of the coin’s mass is made up of copper (2.826 grams), giving the Krugerrand a more orange appearance than silver-alloyed gold coins. Alloys are used to make gold coins harder and more durable, so they can resist scratches and dents during handling. The Krugerrand gets its name from the fact that the obverse shows the face of Paul Kruger, a prominent Boer resistance leader against the British and eventually the fifth, and last president of the old South African Republic holding that office for four terms. The reverse depicts a springbok antelope, one of the national symbols of South Africa that was designed by Coert Steynberg and used on the reverse of the earlier 5 shilling South African coinage for King George VI and Queen Elizabeth II. The name “South Africa” and the gold content are inscribed in both Afrikaans and English.